As we’re putting together our wood shop, we decided to pick up a drill press, and settled on the Shop Fox W1668 because it was small enough to manage, but still had enough power to do what we need. Amazon had the best price and it was prime eligible, so that made the decision on where to order easy. 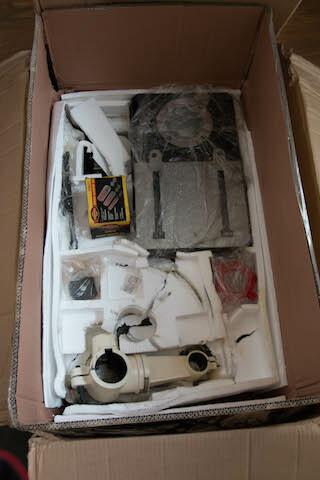 When it arrived, it looked decent, but there had been some serious issues during shipping. The headstock had suffered some serious impacts and was pretty badly damaged. The drive system housing was pretty badly dented and bent, and not just the door. 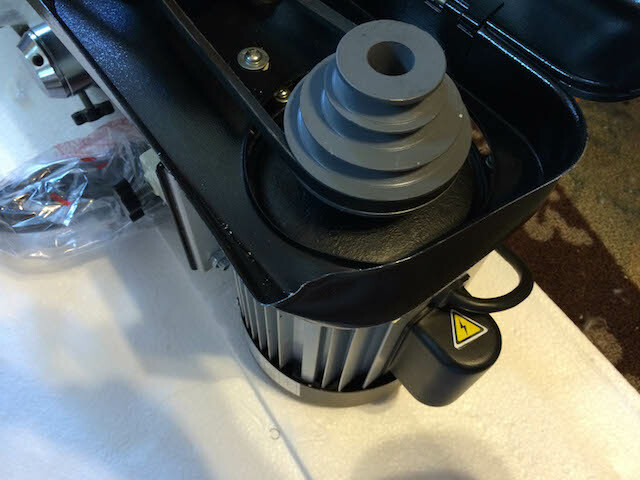 Also, the motor housing had been bent to the point where the motor wouldn’t spin freely. There was a lot of scraping and binding when we tried to spin it by hand. 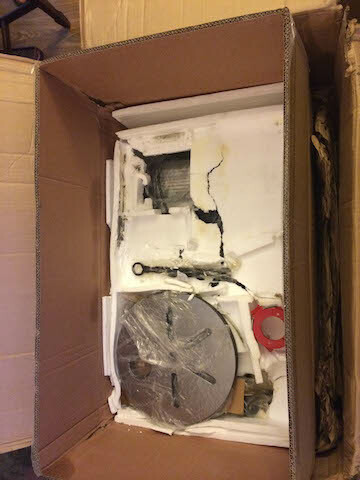 All of this damage was caused by poor packaging not protecting the parts from rough treatment during shipping. Styrofoam blocks aren’t enough padding for something that weighs over one hundred pounds. And the box should have been strapped down to a pallet instead of just being double boxed. That would have protected it from quite a bit of the impact damage. Amazon did step up and send us another one when we called them, and it arrived intact. 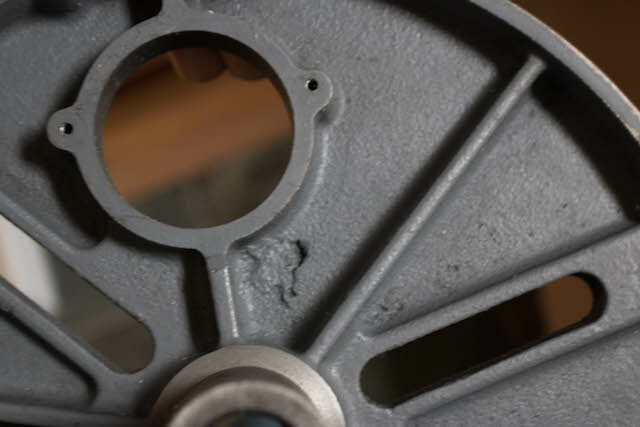 In addition to the shipping damage there were some quality control issues that would have required us to open an RMA even if the first one had arrived intact. The column from the first unit was missing one of the four holes used to bolt it down to the base. Thankfully the one in the second box was correct, so we used that one. In addition, there was a bubble in the casting of the table that was in the second box, so we used the one from the first box. 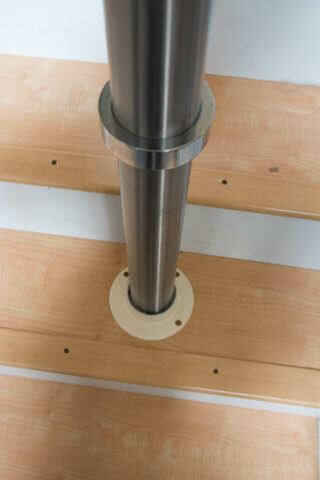 The column with the missing hole. The table from the second drill press, showing the casting issue. I ordered a Shop Fox W1668 drill press, the next to the last tool for the wood shop, from Amazon today. They’re claiming that it’s Prime eligible, which means that the savings on the free shipping should just about cover the Prime annual membership fee. We made our way back up to Woodcraft, Heather fighting way more traffic that I did, to finish our kleenex boxes and the rest of the class. We finished the last cuts on the router and then glued and clamped our boxes. Since the glue took about an hour to dry, we did a bunch of technical discussion about different types of routers, the baseplates, bushings, motors, tables, etc. There was a lot of information that we didn’t know, and if we hadn’t taken the class we probably would have made a bad purchase. Heather and I headed up to Woodcraft in Plano for the first day of a two day router basics class. No, not the networking ones, the woodworking ones. We’ve got some projects around the house that really do need one and we decided that it’d be better to know what we’re doing before we buy an expensive and dangerous power tool. The shop is well designed, with separate workbenches for everyone and lots of room to maneuver. Our instructor is great, he’s patient, funny, and doesn’t pander to the females in the class, instead treating them just like the guys. We’re building a kleenex box, with rabbet joints, dados, chamfers, and some rounding over to make things pretty. It’s all hands-on, with each of us doing every part of the build. So far we’ve got the rabbets and dadoes done, as well as the hole in the lid. In between hands-on work, we’re learning about the different types of routers and bits, as well as safety and what to look for when shopping.